I didn't feel like searching for the solution by hand (given that it might be impossible) so I decided to create a computer program to search for any and all solutions. To do this, I first needed some way of representing a Zome ball positioned in space as well as some nomenclature for describing the various directions taken from a Zome ball. The positive x axis is pointing to the lower left, the positive y axis is pointing to the lower right and the positive z axis is pointing up. Note that the wider side of the strut lying on the positive x axis is parallel to the xy plane, the wider side of the y axis lies in the yz plane, and the wider side of the z axis lies in the xz plane. This is an arbitrary decision (alternatives are equally valid), but the decision is significant because the nomenclature and computer program rely on this particular orientation. Next, I needed a way to represent the coordinates of Zome balls in this space. I started with blue struts of the same length since that is all that the original problem required. 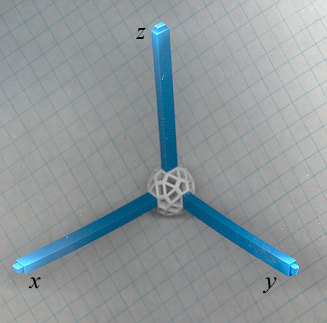 Using 1 as the blue strut length, the coordinates of the Zome balls at the ends of the six axes struts are obviously (+/-1, 0, 0), (0, +/-1, 0), and (0, 0, +/-1). The coordinates of the remaining 24 neighboring balls are not so obvious. As you can see from the above picture, there are three blue (i.e. rectangular) holes in octant 1. In fact, there are three blue holes in each of the eight octants (3*8=24). Due to the symetry of the Zome ball, finding the coordinates of any one of these 24 balls will give us the coordinates of the other 23 balls (thanks to rotation and reflection). I chose to start with the blue hole in octant one that shares a corner with the positive x axis. I used a b3 strut as the positive x axis, a b1 strut as the positive y axis, and a b2 strut as the positive z axis. I then placed a b2 strut in the blue hole in octant 1 next to the x axis. Connecting b2 struts between the ball at the end of the octant 1 strut and the balls at then ends of the three axial struts results in the structure shown in the two images shown here. 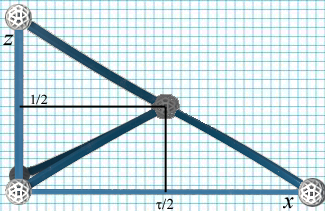 These three values and their negatives can be used in different permutations to express the coordinates of all balls that are at the ends of non-axial blue struts with length 1. It eliminates rounding errors that can accumulate when performing floating point math on digital computers. Integer math is faster than floating point math. Further examination of a Zome ball reveals that each hole (except for 8 amber holes) is adjacent to an axis or is itself an axis. I wanted the nomenclature to be as compact as possible, yet still be readable by humans. After considering several possibilities, I finally decided on using the following three components to refer to a Zome ball hole: its color, the axis to which it is adjacent, and the octant in which it lies. Using one character for each component provides a three character "name" for each hole. The characters I used for each component are shown in the following table. N/A o This is for the amber holes that are centered in each octant. Octant 1-8 1-8 The numbers 1 through 8 are used for the 8 octants. + + This is used for the positive axes. - - This is used for the negative axes. If all of the struts of a Zome construction have the same length, then the hole names are adequate to describe the neighboring Zome balls. If the struts have different lengths, then a size indicator (1, 2, 3) can be added after the color letter to indicate the length of the strut placed in that hole. A series of such names can be used to specify a particular arrangement of Zome balls and struts. For example, a square can be represented as bx+, by+, bx-, by-. An equilateral triangle can be represented as bx+, by2, by7. Having established a coordinate system and a means of representing Zome constructions, it is now time to move on to actually solving the Petersen Graph Zome Challenge.